Choose from simple spray bottles that quickly and efficiently distribute degreaser chemicals, or use a bulk tub of cleanser that you can dilute and use for large surface areas. You can also use some degreaser cleaner to mop your floors, scrub your walls, and clean any other surface where grease builds up over time. Some of our cleansers are also eco-friendly, so you don't need to worry about contaminating the environment! Use our degreaser cleaner to remove grease buildup on your equipment, floors, walls, and fixtures. 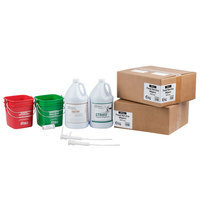 These chemicals come in ready-to-use or concentrated forms, and you can buy them in spray bottles or bulk containers. Choose from all-purpose or citrus based cleaners depending on your cleaning preferences. If you're a green business, be sure to use one of our environmentally-friendly degreaser chemicals! 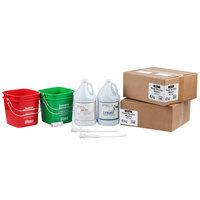 Check out our floor care chemicals, ready-to-use liquid chemicals, and surface sanitizing chemicals for more cleaning supplies. If you're wondering where to buy noble products degreasers, we have a large selection of noble products degreasers for sale at the lowest prices.